Our With-Profits fund is at the heart of Metfriendly's financial success. Essentially, the With-Profits Fund is where all our members’ money is invested on their behalf. The fund is a mixture of assets spread across several investment funds. These assets are equities, commercial property, bonds and cash. You can see the approximate ‘mix’ backing With-Profits contracts in the pie-chart. ALL profits are eventually distributed back to our members in the form of annual bonuses and normally a final bonus. When Metfriendly’s investments perform well and produce a profit we aim to distribute this to our members by adding bonuses. Sometimes however, adverse market conditions (or a poor long-term outlook) may mean it’s necessary to lower our bonus rates. 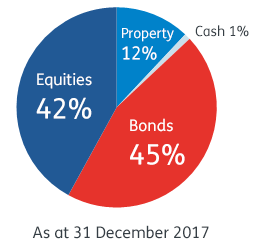 We keep about half of our total funds in bond and cash funds to provide the necessary security for the benefits that we guarantee to pay – the Sum Assured and all Annual Bonuses so far added to members’ With-Profits contracts and to back our policies which are not with-profits (guaranteed savings and protection plans). The fund has grown significantly over the years and now stands at over £163million. We are proud of our past performance – that is, the returns we have achieved for our members. Considerable detail as to how we manage the With-Profits fund and members’ benefits is given in the full Principles and Practices of Financial Management. A more ‘consumer friendly’ summary aimed at explaining the salient points can be found in How We Manage The With-Profits Fund. Great opportunity for family members to be offered the same offers as members. Good service – always very helpful and informative. Very happy with the service. I have a number of policies for myself and my children. Metropolitan Police Friendly Society Ltd is authorised by the Prudential Regulation Authority and regulated by the Financial Conduct Authority and the Prudential Regulation Authority (Firm ref No. 110026). What is a Friendly Society?